D’Anca’s Auto Collision, Auto Body and Classic Car Restorations in Palm Springs has been the “Go To” auto detailing venue since 1985 and with good reason. The elite residents of the beautiful Palm Springs area deserve and expect the very best in top quality customer service and valet car care. Professional detailing services are one of our specialties and we take great pride in working on some of the most exquisite and expensive automobiles in the world. 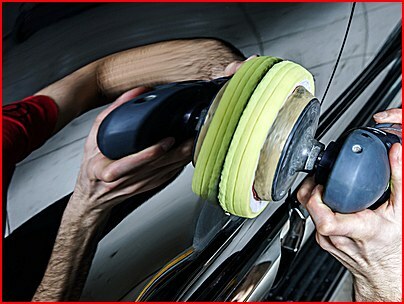 Whether your car is a Bentley, a Mercedes, a beautifully restored classic, an SUV, a work van or simply your old faithful favorite vehicle, you can be sure that D’Anca’s will give it the “Celebrity Friendly” red carpet treatment that we know you would give yourself if you were doing your own detailing. Our specialty interior detail includes a deep cleaning of the entire interior with choice treatment for natural fibers, carbon fiber composites, vinyl, plastic and upholstery. We custom tailor our techniques to suit the specific surface that we are cleaning. Our white glove inspection assures that every inch of your automobile interior is immaculate to perfection. Our famous exterior detail restores the original, pristine condition of your vehicle’s surface with a glossy finish that includes chrome trim, window polishing, and our spectacular wheel and tire detail. Using only top quality products and acid-free degreasers the exterior of your vehicle is waxed and polished with our softest towels and brushes to ensure a show room worthy finish every time. The care and beauty of your vehicle is our business and we take it seriously. We know you could choose others so we appreciate your business and work to retain you as a lifelong customer.